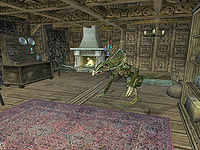 Help an exasperated Bosmer shake off a suitor's unwanted expressions of affection. Speak to Gorinia to be asked to remove a clannfear from her home. Go into the house and kill the clannfear. Speak to Gorinia to find that the person responsible has locked himself in her room. Go and persuade Rinar Sandras to leave Gorinia alone. Speak to Gorinia again to complete the quest and receive 125 Gold reward. Find Gorinia standing outside her home in Firewatch, where she will tell you that there is a clannfear in her home. Naturally, she wants you to dispose of it for her. Go into her house (it's unlocked) and you will be standing in front of the clannfear. Simply kill it and go back outside to speak to Gorinia again. She will then tell you that a Dunmer named Rinar Sandras had summoned the clannfear to show off, but lost control of the daedra and locked himself in the bedroom. She will then give you the key to the bedroom and ask you to convince Rinar to leave her alone. Go back into the house and down the stairs to the only interior door and find Rinar Sandras inside. When you speak to him you will be given the choice to threaten him with calling the guards, or another choice. If you select the other choice, you will get nowhere until eventually you are forced to threaten him with the guards. At any rate, doing so convinces him to follow you. Lead Rinar outside for a journal update, and then speak to Gorinia to have the key to her bedroom removed from your inventory and be rewarded 125 Gold, completing the quest. 10 Gorinia asked me to kill the clannfear in her house. 20 Rinar Sandras told me that he summoned the clannfear with the intention of vanquishing it and "rescuing" Gorinia, but it broke free of his command and he locked himself in the bedroom for safety. 30 Gorinia thanked me for killing the clannfear. She told me it was summoned by Rinar Sandras, a dark elf that has been unsuccessfully pursuing her affections. She asked me to kick him out of her house. 40 Rinar Sandras has followed me out of Gorinia's house. 100 Finishes quest Gorinia thanked me for ridding her house of the "foul creature." I don't think she was talking about the clannfear. This page was last modified on 6 March 2019, at 07:19.